Hakusan, Japan, November 15, 2016 – EIZO Corporation (TSE: 6737) today announced the release of the RadiForce RX660, a 30-inch 6 megapixel monitor ideal for multi-modality applications. It is the successor model to the RadiForce RX650 and features new functionality for improving reading room efficiency. 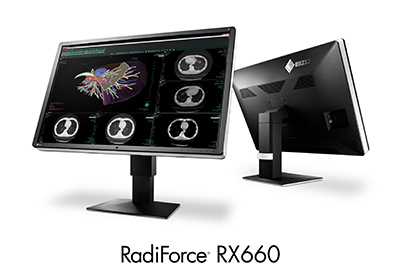 The RadiForce RX660 is equipped with EIZO’s original space and time saving function called Work-and-Flow which is included with the bundled RadiCS LE software. Work-and-Flow allows radiologists to easily show or hide a PinP (Picture in Picture) window allowing them to view two separate video inputs within a single monitor. This is perfect for eliminating a monitor that is viewed infrequently – such as examination lists – and is easily operated by moving the cursor to the corner of the monitor. Additionally with Work-and-Flow, USB switching is done within the monitor so users can work on multiple PCs using only one mouse and keyboard. Users simply move the cursor across the screens to quickly start working on another PC. With these two functions, Work-and-Flow provides quick and easy information referencing and a barrier-free workstyle. Compared to its predecessor, the RadiForce RX660 hosts a slimmer, more compact housing for a more efficient workspace. The monitor’s width and depth have been reduced by 9.5 mm and 56.5 mm respectively. In addition, the size of the power supply was greatly reduced and now comes built into the monitor. This results in a monitor that takes up 23% less space, giving radiologists more room for other tasks. It is also 6 kg lighter than the previous model for ease of installation. The monitor is equipped with DisplayPort 1.2 input and output terminals which means that 6 megapixel resolution can be achieved using a single cable. The output terminal can then be used to attach additional monitors in a daisy chain sequence removing the hassle of excess cables. The 6 megapixel screen provides ample space for displaying numerous applications at once, making it an effective replacement for a dual 3 megapixel monitor setup. Healthcare professionals can conveniently view images side-by-side without the obtrusive bezels typically found in a multi-monitor environment. The RadiForce RX660 comes equipped with EIZO’s unique Sharpness Recovery technology which restores sharpness that is typically lost due to the high brightness requirements of medical monitors. This ensures the screen displays images with a level of clarity that is true to the source data. EIZO will be demonstrating the RadiForce RX660 at Booth 3706 in South Hall A at the 102nd Radiological Society of North America (RSNA 2016) from November 27 to December 1 at McCormick Place in Chicago, Illinois (USA). The RadiForce RX660 will begin shipping in February, 2017. Date of availability varies by country so contact the EIZO group company or distributor in your country for details. All product names are trademarks or registered trademarks of their respective companies. EIZO and RadiForce are registered trademarks of EIZO Corporation.